Is building a website for your business, blog or social networking hangout on your agenda? If you’ve considered using a content management system (CMS), it’s likely you’ve heard of the three most popular open-source tools: Drupal, Joomla and WordPress. While each is designed to facilitate website building, all three offer different features and levels of usability. Even though Drupal, Joomla and WordPress are free, it’s important to choose the one that works best with your skill level and website goals for the best results. As far as features go, Drupal, Joomla and WordPress deliver an assortment of tools. Drupal offers a strong community platform. Users can take advantage of the various social networking features to reach out to customers/readers on Facebook, Twitter and other similar websites. 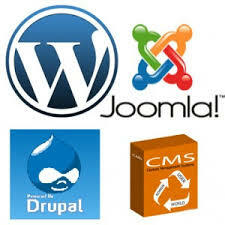 Joomla is much more systematic in its content management approach. You’ll have access to tagging, labeling, and organization tools, which will aid you in creating more structured, accessible content. For beginners and experts alike, WordPress is ideal. With an array of themes and educational features for inexperienced users, it’s perfect for building quick, attractive sites. Each CMS offers varying degrees of usability, and one or the other may be more beneficial to you based on your website building experience. Drupal is probably the most technical, and requires the highest level of design and development know-how. However, it produces progressive, professional end-results. If Drupal is the most technical, and WordPress is the least technical, then Joomla is somewhere in the middle. Joomla requires some structural know-how and produces fairly advanced sites, while WordPress is highly intuitive and great for simple site building. The features and usability of each CMS tool differs from one another, so it only makes sense that they’re intended for different purposes. Due to its technical design, Drupal is perfect for intricate website building, such as community-oriented sites and e-commerce. In that regard, Joomla is very similar. Highly versatile and structured, Joomla can build online stores and community platform sites with ease. If you need to create a simplistic blogging or news site on the fly, WordPress is ideal. This rings especially true if you don’t have the time to build a site from scratch. JaguarPC offers options for the best web hosting across the Joomla, WordPress and Drupal CMS platforms. Contact our sales team [email protected] to learn more about how to get your Joomla, WordPress or Drupal website or blog published and distributed across the Internet for the highest possible exposure levels.